Motorcycle Parts. Motorcycle Accessories. The product has the pilot lamp,when the switch turn on,the pilot lamp will be lighting,or,the lamp will off. 1 X Light Switch. Item Located In US KYN/TX/WC Warehouse! 1Pcs X Switch. Custom DIY Motorcycle Handlebar Engine Stop Start Kill Lever Dual Switch Button. Car Stainless Steel Pipe Exhaust Muffler Rear Tail Throat Liner Bevel Universal. Car Windshield 57cm Amber LED Strobe Warning Light Bar with Suction Cup 13 Modes. The push-buttons are of high quality, very robust design and vibration- and spraywater-proof (IP65). The compact design casing permits mounting two or more units on one handle bar. 1Pcs X Switch. Each unit is equipped with three push-buttons in Black. New 7/8" 22mm CNC Motorcycle Steering Yellow Light Handlebar Grip Left & Right. Motorcycle 18RCS Piston Brake Clutch Levers Master CNC Aluminum Red 7/8" Pair. 2000LM Motorcycle Angel Eyes USB Headlight Spotlight Amazing 3 Colors LED Light. Emgo Ignition Switch - 40-80600. Two keys included. 1x Right Side Motorcycle 7/8" Handlebar switch. Fits 7/8" Handlebars(Right Side). We have professional team to care about every piece of fairing sale from us. Best sevice is the key to make we stand out. Handlebar Size:7/8" (22mm). Other Part Number: Motorcycle Handlebar Switch 7/8" 22mm 12CV. Function of Right Switch: Horn,Turn Signal Light, High/Low Beam, PASS Switch. 1x Handlebar Switch. Function Integrated with Horn switch, Turn Signal Light change-over switch. The casing is made from CNC machined billet aluminium reflective black/mirror polished finished surface. Case Material:CNC aluminum-alloy. The compact design casing permits mounting two or more units on one handle bar. 2Pcs Switch. 4Pcs Motorcycle 24 LED White DRL Flowing Amber Turn Signal Indicator Lights Lamp. 1x 15" SUV Car Steering Wheel Cover Protector All Season Breathable PU Fabric. Wiring Harness kit Electrics Wire Loom Assembly For CHINESE GY6 150CC ATV QUAD. Material: T6063 aluminum alloy. Red is a self-locking switch, green is a lockless switch. Switch applicable: universal. 2x Universal Aluminum Motorcycle Dirt Bike Footrests Foot Peg Mount Pedals Black. 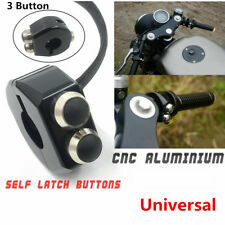 1 Dual Buttons Motorcycle Handlebar Switch. Made of aluminum alloy material CNC processing ,it is weatherproof and very durable in using. Waterproof :IP65. Material: Aluminum Alloy. Universal fit for any 12v DC electrical system. Made of aluminum alloy material CNC processing ,it is weatherproof and very durable in using. Material: Aluminum Alloy. Easy to install and convenient to use, perfect for your motorcycle modification. Ignition Switch Covers. 1 X Waterproof Light Switch. Exhaust Parts. For Victory. Instruction is not included. Speaker Parts. Multiple protection, safety to use. Instruction: No Included. Trending at $13.51eBay determines this price through a machine learned model of the product's sale prices within the last 90 days. The casing is made from CNC machined billet aluminium reflective black/mirror polished finished surface. Case Material: CNC aluminum-alloy. The compact design casing permits mounting two or more units on one handle bar. Material: CNC Aluminum Alloy. It can be used on Headlight Fog Brake Hazard Light and other available part. Its suitable for Motorcycle Motorbike ATV Sport Dirt Electric Bike Interrupteur Moto. Universal Motorcycle Rear View Mirror Bracket Handlebar Switches handlebar design. 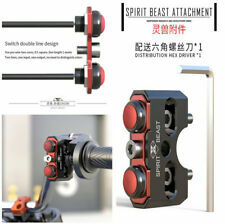 1 Motorcycle Handlebar Switch. Made of aluminum alloy material CNC processing ,it is weatherproof and very durable in using. Material: Aluminum Alloy. Easy to install and convenient to use, perfect for your motorcycle modification. Made of aluminum alloy material CNC processing ,it is weatherproof and very durable in using. Easy to install and convenient to use, perfect for your motorcycle modification. Light Color:Green. We will reply you within 24- 48 hours. Fit for Harley Suzuki BMW Ducati Bobber Chopper Honda Yamaha Kawasaki KTM Aprilla Triumph MV Agusta Bimota Buell Momo Guzzi, ect. We will reply you within 24- 48 hours. Direct OEM replacement Two keys included. The casing is made from CNC machined billet aluminium reflective black/mirror polished finished surface. 1Pcs X Switch. Case Material: CNC aluminum-alloy. We will reply you within 24- 48 hours. Function: Low/High Beam Switch, Horn, Turn Signal change-over switch, overtaking light button. 2x Handlebar Switch. Electric start switch, headlight on/off switch, ignition button. Condition: New. Suzuki, Yamaha, Kawasaki, Harley, KTM, Ducati, Aprilia, Vespa, Kymco, Piaagio, Agusta. The compact design casing permits mounting two or more units on one handle bar. 1PC X Switch. We will reply you within 24- 48 hours. Switch applicable: universal. Red is a self-locking switch. 360° Rotation Motorcycle Handlebar Holder Stand Clip Bracket For 4"-6.5" Phone. Red LED Recessed Tail Light with Bracket Waterproof for Motorcycle Dirt Bike. Waterproof handle, fits all weather conditions. Can be used as ON OFF Start Kill switch for general lights, hazard light, fog light, head light and enginee power outlet. 54cm Wire,you can fit it on anywhere on your motorcycle. 1x Quad Wire harness. We will reply you within 24- 48 hours. Cable Length: approx. We will reply you within 24- 48 hours. Button: manual reset in the middle, automatic reset on both sides. Applicable models: General Whether the switch button is manually reset or automatically reset, you can customize it. Case Material: CNC aluminum-alloy. Motorcycle Exhaust Mid Pipe Muffler Connect Link Pipe for Suzuki GSR 750 GSR750. 38-51mm Motorcycle Exhaust Pipe Muffler With DB Killer Silencer Stainless Steel. Universal Large Capacity Stylish Carbon Fiber Stripe Motorcycle Tail Bag Storage. Integrated with Signal Switch,Horns Switch and Low/High Beam Switch. Honda,Suzuki,Yamaha,Kawasaki,Harley,KTM,Ducati,Aprilia,Vespa, Kymco,Piaagio,Agusta,BMW. 1 x Motorcycle Switch. All Motorcycle motorbike with 7/8" handlebars. Thread Size: M10x1.25mm. For most kinds of Motorcycles,such as DUCATI KTM. 1x Hydraulic Brake Switch Cable 2x Gasket. Use for Hydraulic Brake system. E-checks will be held until cleared. Waterproof 12V Motorbike 22mm Alloy Handlebar Headlight Spot Light On Off Switch. Product Type: Waterproof Light Switch. 1 x Waterproof Light Switch. Material: Aluminum Alloy. Universal for any Motorcycle and ATVS. Can be used as ON OFF Start Kill switch for general lights, hazard light, fog light, head light and enginee power outlet. Universal 7/8" handlebar design, can be fit on most of motorcycles. 54cm Wire,you can fit it on anywhere on your motorcycle. 1 Dual Button Motorcycle Handlebar Switch. 2Pcs CNC Aluminum Motorcycle Handlebar Horn Engine Start Kill Switch With Cable. Easy to install and convenient to use, perfect for your motorcycle modification. The casing is made from CNC machined billet aluminium reflective black/mirror polished finished surface. Case Material: CNC aluminum-alloy. Cable lenght:Approx.55mm. 1Pcs X Switch. Each unit is equipped with three push-buttons in Black. Mount Hole for 20-24mm Handlebar. Clock：Adjustable. Suitable for all12V battery installation motorcycles,motorbike,scooter. Motorcycle Parts. The product has the pilot lamp,when the switch turn on,the pilot lamp will be lighting,or,the lamp will off. Product Type: Moto rcycle Handlebar Switch. Button Type：. 2x Universal Flexible 18 LED Motorcycle Tail Brake Stop Turn Signal Strip Light. 4X Motorcycle Grill Bullet Blinker Turn Signal Light For Bobber Chopper Cruiser. 1 pair of Motorcycle 7/8" Handlebar switch (Left Side and Right Side). Work on any 12v DC electrical system. We will reply you within 24- 48 hours. Universal CNC Billet Kill Switch For ATV, Motorcycle, Scooters,Quad etc The Housing Is CNC Machined From Billet Aluminum. CNC Universal Motorcycle Engine Stop Start Kill Switch Button Dirt Pit Bike Quad. 12V Motorcycle Waterproof ATV Handlebar Fog Spotlight On Off Switch. 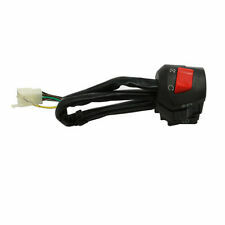 1 X 12V ATV Motorcycle Handlebar Switch. TYPE:Electric On Off Switch(Fog Spotlight On Off Switch). FLASH MODE. With pilot lamp,when the switch turn on,the pilot lamp will be lighting,or,the lamp will off. Function: Can be used for high/low beam, on/off, start/kill, headlight, Throttle Switch. Heavy duty plastic housing for perfect durability. We will reply you within 24- 48 hours. Thread Size: M10x1.0mm. For most kinds of Motorcycles,such as Ducati KTM. Use for Hydraulic Brake system. 1x Hydraulic Brake Switch Cable. Universal Straight Gland Brake Pressure Switch. A simple and affordable universal brake pressure switch. The casing is made from CNC machined billet aluminium reflective black/mirror polished finished surface. Output circuit protection, overload protection, reverse polarity protection, multiple protection, safety to use.